The 54"H Black Gondola Unit with Glass Shelves is the perfect merchandiser for gifts, folded apparel, and beauty products. 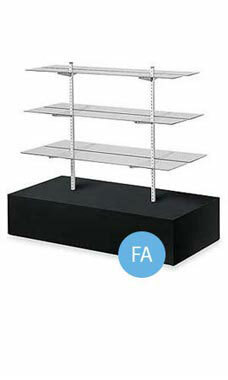 Our gondola units feature a 60”L x 30” laminated wood base with 6 adjustable shelves. Wood crating for secure shipping is included in the price of the tower.